Italy - Angry rioters attacked police and state property in numerous cities across the country following Sunday's accidental police shooting death of a football fan at a highway rest stop in Tuscany. Gabriele Sandri, a 26-year-old disc jockey from Rome was fatally shot in the neck while sitting in his car as police attempted to break up a fight between other football fans. 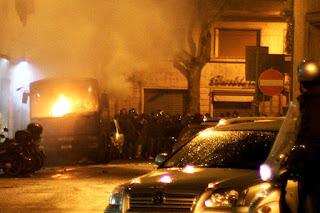 Hooligans from rival supporter clubs joined together and laid siege to Rome's main police barracks overnight breaking windows, burning police vans and a bus and damaging scores of police motorcycles as well as cars. 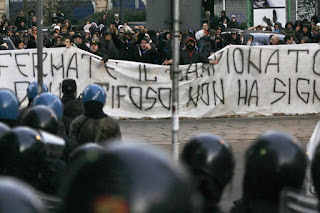 They also looted the nearby Italian Olympic Committee headquarters causing an estimated $147,000 (€100,000) in damages. At least 40 officers required hospitalization. In Milan hundreds of sports fans held a protest in front of the Italian State TV RAI headquarters. As tensions grew high demonstrators bombarded police with rocks and beat two journalists. A total of four people were detained by police during the unrest and face charges of vandalism and terrorism.